This time you can choose from hotel deals in some of the most popular cities in the US. If you wish for a few days in Las Vegas, you can get the Treasure Island hotel and casino from $62 per night saving as much as $42 a night off average rates. Or travel to Orlando and stay at the International Palms Resort from $47 a night, visit Daytona Beach and spend a few nights at Plaza Ocean Club from $53 or travel to Hawaii for a getaway at Honua Kai Resort for $274. Hurry, these might sell out in a glance! 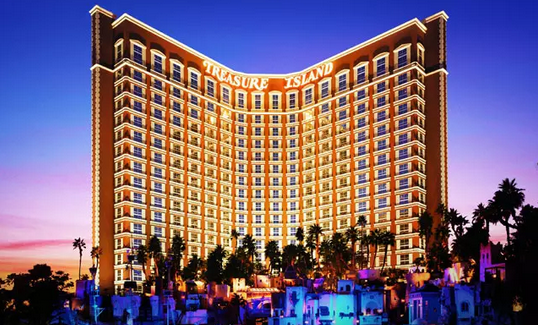 Book the Treasure Island hotel and casino through the summer of 2016 and save 40% on the 4 star Las Vegas resort. Choose some travel sites from the box to be able to compare prices and maybe find a cheaper 4 star hotel in Vegas. This entry was posted on Tuesday, March 29th, 2016 at 2:12 am and is filed under Hotel Deals, Top Deals. You can follow any responses to this entry through the RSS 2.0 feed. You can leave a response, or trackback from your own site.